You are currently browsing the tag archive for the ‘roe deer’ tag. a mystery…can you help solve it? A few days before my knee op I inadvertently found myself at the centre of drama taking place along one of our boundaries. I’ve never seen, heard or experienced anything similar before. No one to date can shed any light on the affair, not even a dear friend of mine, an elderly knowledgeable person who spends most of his spare time walking and stalking woods, meadows, moor and heath filming wildlife, especially deer. I’d love to know if you or anyone you know may have come across a similar incidence. It all began at about 2.30 to 3 o’clock on Sunday afternoon as I was going outside to do various jobs. I was pulling on my wellies when the most spine-chilling screams pierced the air from the direction of Dung Field. 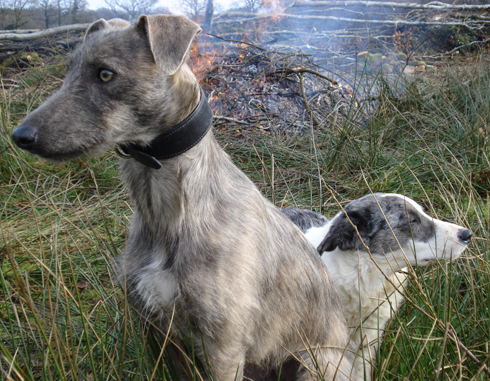 The dogs, instantly alert, ears pricked, eyes brightly-wide, adrenalin pumping at the expectation of chase, blood and gore. Somehow managing to rein them in I began to walk in the direction of the blood-curdling shrieks. From experience I knew the sound was made by roe deer and my immediate thought was that a deer had become hung up in a fence and was being attacked, its twin or mother trying to protect it. Walking up the remnant of our old green lane past Turkey Shed and the orchard the macabre noises proved too great a temptation for the Skye and Ness (generally paragons of ‘oh-look-how-good-I-am’ virtue in front of the puppy) who took off at the speed of light totally ignoring my stern commands. In a matter of seconds two already exhausted roe deer burst through the hedge alongside Dung Field in terrified panic – Willow, no longer able to contain herself, broke away from my side in hot pursuit (unfortunately I was leadless as I had been on my way out to do jobs around the yard, not walk dogs). One of the deer just managed to leap the fence into the orchard whilst the other stalled her jump and seemed on the point of collapse. There was no sign of either Skye or Ness. Willow, however, continued her pursuit. Too small and slight to bring down a deer, she nevertheless sensed her quarry weakening and so proceeded to dance round the creature with frenetic high-pitched yips, occasionally darting in and out with small nips. Horrified I bawled at her as I launched myself through the thick bramble, blackthorn, hawthorn and god-knows-what-else-hedge, tripped and stumbled over rusting barbed wire and sagging stock fencing to get to the pair. None of my admonishments, bellows or shouts had the slightest effect on Willow, turned frenzied hunter with her quarry. As I walked I watched the ravens – if there was chance of a good supper so near their nesting site they would be defending it and true enough they were active and keen – seeing off a buzzard…but then they’re active at this time of year anyhow, mating, nesting. I walked on; the screams were moving up and down, loud and faint, which was beginning to put paid to my deer-hung-in-fence theory. As I approached the gate to Dung Field a large dog fox was trotting towards me oblivious for a minute or so to my presence…he darted into Raven’s Copse as soon as he clocked ‘human’. “No. Unfortunately I can’t find anything. Nothing. Nothing at all. I really have no idea what’s going on.” So I recounted the story and finishing off with the fox, the ravens’ activity and the sheep huddled together in a corner of the field. “I’m completely at a loss.” I said shaking my head. We continued scouring the fields a bit longer before returning home, when once again another haunting scream floated over the darkening countryside. What had occurred? There must have been three deer at least. A doe and her yearling twins perhaps? Why the distress screams, the exhaustion, the panic? And when we landed back at the farm? We collapsed, gasping deep breaths of apparent tranquil Englishness greenness; an illusion nevertheless! In fact the countryside thrummed with industry as every farm for miles around unwaveringly and single-mindedly mowed, turned, raked and baled their forage fields in a race to make silage, haylage or hay. Unsurprisingly this year everybody was determined to beat the weather! I was overcome. My neighbours and contractors had done me proud. Knowing my anxiety at being away they’d come in over the weekend and despite being under huge pressure themselves had worked unrelentingly to finish my harvest! I couldn’t find the words to thank them enough. What wonderful neighbours. This was just the perfect homecoming; hundreds of bales of quality June haylage for the stock this winter and the opportunity to take a second-cut of ‘rocket-fuel’ as we’ve nicknamed it (the second-cut in organic systems is bursting with clovers, proteins and sugars; soft and palatable it’s perfect for weaning calves and freshly calved cows). I was ecstatic! All that was left to do was to carry in the bales. This was something that could happily wait a few days. “A fox, Nanu? A fox? In there?” Asked Squiggs aka Theo. “Not sure, sure. 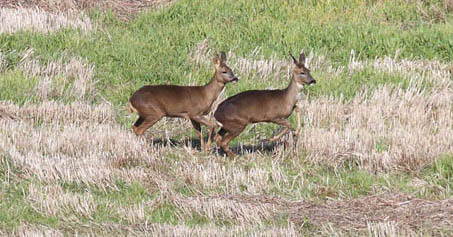 But…” I trailed off – the dogs had started up an excited hunting yelp along the side of Rushy field. Followed by one of the most chilling screams I’d ever heard. “Run Wiggle, run, run, run with me” I got hold of his hand and ran as fast as his legs would carry him along the lane. We reached Rushy Field gate. The screaming and yelping had reached a crescendo. He looked a bit askance. I could see him sizing up the alternatives. The noise was frightening. But it could be exciting. He could go on up the lane to the bales. But maybe there was something in following Nanu. Looking at me solemnly, he nodded. “Good boy! I’m off now.” And with that I pelted across the field whistling and calling to the dogs having no idea what I would find. Breathless I reached the other side and thank god saw Theo following. Ness suddenly erupted out of the hedge, her mouth wide and frothing, tongue lolling, wet, muddy and panting as if her heart would pop. She flung herself at my feet. Skye, just as run-out emerged higher up the field. I was about to turn and call out to Theo that all was well when I heard a loud splashing in the stream. “Oh no” I thought and fought my way through a tangle of bramble, thorny blackthorn and low slung willow branches “Oh no” I muttered as I pushed through to the edge of the steep stream bank. A bloodcurdling scream filled my ears and there was a young roe deer buck, desperately scrabbling to get out of a deep pool of muddy water. His eyes enormous with fear, his nostrils dilated, breath jerked out of him in jagged rasping wheezes. He caught a glimpse of me uttered a spine-chilling screech, floundered and sunk under the muddy, blood-stained water. I jumped in, scrambled to get hold of him, stop him from going under. Terrified and gasping for breath he screamed and kicked at me frantically with fear-strengthened legs and hooves as somehow I managed to put my arms around him. Then I saw. His neck, lolling helplessly to one side, puncture wounds stippling its circumference trickling trails of watery blood. An open gash along one shoulder. He screamed again and quietened momentarily in my arms. “Nanu, nanu? What you doing?” I looked up and there was a grimy, scratched Theo looking down on us and not at all sure if this was frighteningly serious or a kind of weird Nanu game. “Nanu what is you?” he asked puzzled. Simultaneously I heard Olly calling “MUM, MUM? What’s happened? Where are you? I’m coming!” and in the background Joe shouting “Theo, Theo! Mum is Theo with you. Mum! Theo! Will you answer? Answer me!”…. I had to show you these photos. Walking with the dogs an hour or so ago we were coming up through some woodland at the edge of the moor into what I call the Lost Field (it’s a small hidden meadow surrounded by woodland, silently quiet and heaving with wildlife) when we surprised a roe deer. I dropped the dogs instantly. As she bounded off I noticed liquid spraying out from her behind. “What on earth…?” I thought. Then it dawned, we’d unfortunately disturbed her in the middle of dropping her fawn. Gathering the dogs close to me and keeping as silent and as unobtrusive as we could we walked quickly across the field but there right in our path was the newborn fawn; tiny, minute and damply perfect. Hissing at the dogs to lie down and not move a muscle I quickly took some photos. Shaking in haste I thought the pictures would be useless. But they are OK.
can you see its tiny pink tongue? I hope with all my heart the doe finds the courage to return. I did my best not to leave too much of my scent nearby, and we left without disturbing her fawn.